A warm welcome to the Heimataerde-Orden (Heimataerde-Order), the official Fanclub of the band Heimataerde. No other album has impressed me so much like the current album "Unwesen" of the band Heimataerde. The mixture out of amazingly powerful electric sound, the musical elements of the medieval and the historical songs out of this old times, as well as the historical background of the crusade is fascinating me from the first note till the last tone. This symbioses which creates such melodic and danceable songs, affords such complexity and being able to inspire every time new. My curiosity has been awoken and as I searched for more information about this band and their music, I arrived at the homepage of Heimataerde. Regretfully, I asserted that there was no community fanbase in which I could be part of. Should a band like Heimataerde which is so complex and being able to connect so much different genres like EBM, the medieval, vampirism, and historical background out of movies and eras into one musical combination, bringing so much different types of people together, not have one fanbase? A fanbase, where interested people could interchange with each other, to find a way to support Heimataerde? Of course, you will find here all current news from Ash about Heimataerde, from news about upcoming albums, concerts up to remix works. Furthermore, there is the possibility, to ask questions directly to the band about things you have always wanted to know. 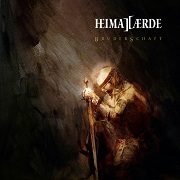 However, all other topics outside of Heimataerde you may be interested, will find their place here, because so complex the music of Heimataerde is, so different and interesting are the personalities of their fans. This will be the principle of this fanclub and everyone will be invited to be part of the congregation, to make himself comfortable and bringing the forum to life. Ash and I would be very glad, if you would make this fanclub to an eclectic as well as an interesting place of exchange between fans.